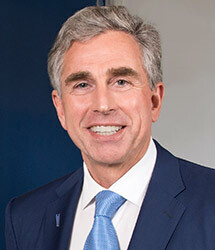 Russell Goldsmith is chairman and chief executive officer of City National Bank, which was acquired by Royal Bank of Canada (RBC) on November 2, 2015. Mr. Goldsmith also leads RBC Wealth Management in the United States, a nationwide business that serves 320,000 households through 1,700 financial advisors in 40 states. City National Wealth Management and RBC Wealth Management-U.S. oversee combined client investment assets of more than $350 billion. When Mr. Goldsmith became City National’s CEO in 1995, the company had $3 billion in assets, 1,300 colleagues, and 24 offices in Southern California. Today, it has $45 billion in assets, 4,200 colleagues and 72 offices in six states. It also manages or administers $58 billion in client investment assets. In 2016, Mr. Goldsmith was named one of Los Angeles’ 16 “civic icons,” by the Los Angeles Business Journal as part of its inaugural list of the most influential individuals in Los Angeles. In 2013, the publication named him “Business Person of the Year” for his leadership of City National Bank and his role as an advocate for economic growth and job creation. From 2008 through 2011, he was a member of the Federal Reserve Board’s 12-member Federal Advisory Council, representing the Twelfth Federal Reserve District and serving as its vice president for two years. In 2010, Mr. Goldsmith founded the Mid-Size Bank Coalition of America, which is composed of more than 50 banks across the United States. He chaired the organization until 2015. Mr. Goldsmith serves on the board of directors of Cedars-Sinai Hospital in Los Angeles and is a member of both the Council on Foreign Relations and the Pacific Council. From 1986 until it was sold in 1994, Mr. Goldsmith was chairman and chief executive officer of publicly held Republic Pictures Corporation, a leading global independent entertainment production and distribution company. He was also vice chairman of the San Diego Padres Baseball Club from 1990 to 1994. He previously served as chief operating officer and a director of Lorimar, Inc., a public entertainment company, from 1983 to1985. Mr. Goldsmith began his professional career as an entertainment attorney in Los Angeles. He is a graduate of Harvard College and Harvard Law School.